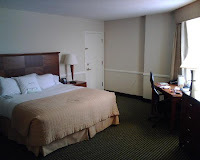 I recently stayed at the Doubletree Hotel Park Place on Business for two nights. This is one of those hotels where the staff make all the difference in the world. While the hotel is very nice and what you expect from Doubletree, the attention to the little extras and the service from the staff really make this hotel special. The hotel and rooms are immaculate and it is obvious the staff takes pride in keeping the property well maintained. The room was very comfortable. 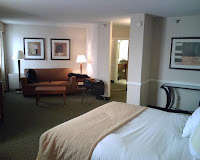 I was in a junior suite, an over-sized king room, and it was very functional with a great king bed, sofa and seating area, good desk and chair and a functional bathroom. There is a standard TV in the room which works pretty well although you like to see plasma's when you travel. The room was cleaned perfectly on arrival and throughout my stay. Housekeeping, like all the staff, pay attention to everything and its nice to come back after a long day to find everything replenished. There is free bottled water and a robe for your use. The internet worked perfectly the entire time and the climate control worked well (you can also open the windows which is nice). The fitness room is wonderful with modern equipment (3 treadmills, 1 elliptical and 2 cycles). I didnt go in the pool but it looked very nice as well. I ordered room serve and while it took a little while to arrive it was hot and good. I could only find one downside my entire stay and that is, for reasons passing understanding, there is only 1 towel in the bathroom. This could easily have been just another doubletree but the staff here is first rate, very caring and very attentive. If you are a diamond member they give you free breakfast, desert and internet and it is always nice to be recognized. I would definitely return to this hotel next time I am in town.